Mgr McCrann at his 50th anniversary Mass of his Ordination to the Priesthood. Photo: Sourced. Monsignor Peter Francis McCrann died peacefully on Sunday 17 February at the age of 95, with his funeral held at St Mary’s Cathedral on 28 February 2019. 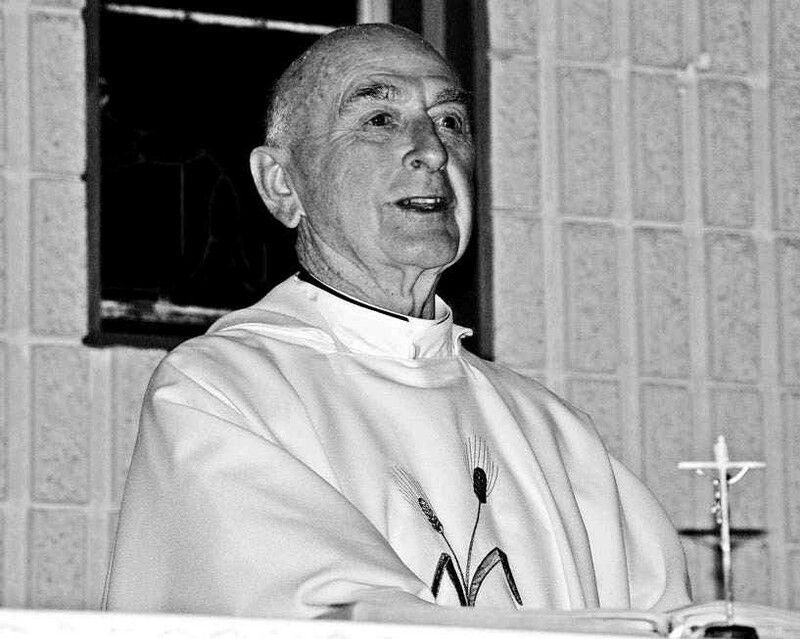 Mgr McCrann was born in Yalgoo in the Geraldton Diocese on 31 July 1923 and was later trained as an altar boy by the Dominican Sisters at their convent chapel during the time in which famous architect-priest, Monsignor John Hawes was based in Yalgoo. He later moved to Perth with his family, attending Christian Brothers College (CBC) Fremantle in his schooling years. With two of his mother’s sisters being nuns – one a Presentation Sister in WA, the other a Sister of Our Lady of the Sacred Heart in Sydney, Mgr McCrann has previously said that there had always been a strong spirituality that pervaded his entire life. Upon completion of his high school studies at CBC Fremantle, he asked his local Parish Priest if he could join the priesthood, but was told that there was an excess of priests in Perth and would have to “go over east” if he wanted to enter the seminary. Emeritus Archbishop Hickey presenting Monsignor Peter McCrann with an Apostolic Blessing from the Holy Father. Photo: Sourced. Mgr McCrann chose instead to stay in Perth and began his career with the Commonwealth Bank which led to an Executive Cadetship offer, later attending its staff college at Kirribilli NSW. At 18, he was conscripted into the Australian Imperial Force and was posted to Hollandia at the eastern end of Dutch New Guinea, after which he rose to the rank of Warrant Officer under the command of the now famed General Sir Thomas Blamey. When Mgr McCrann returned from the war, he continued working for the Commonwealth Bank of Australia and also majored in economics at the University of Western Australia, where he gained his accountancy secretarial and banker’s institute qualifications. However, the priesthood was still on his mind and had always been; never doubting his vocation, even throughout the war. He was finally accepted into St Charles’ Seminary in 1952 where he received his first years of formation for the priesthood before continuing his studies at St Patrick’s Seminary in Manly NSW, where he was Head Prefect. 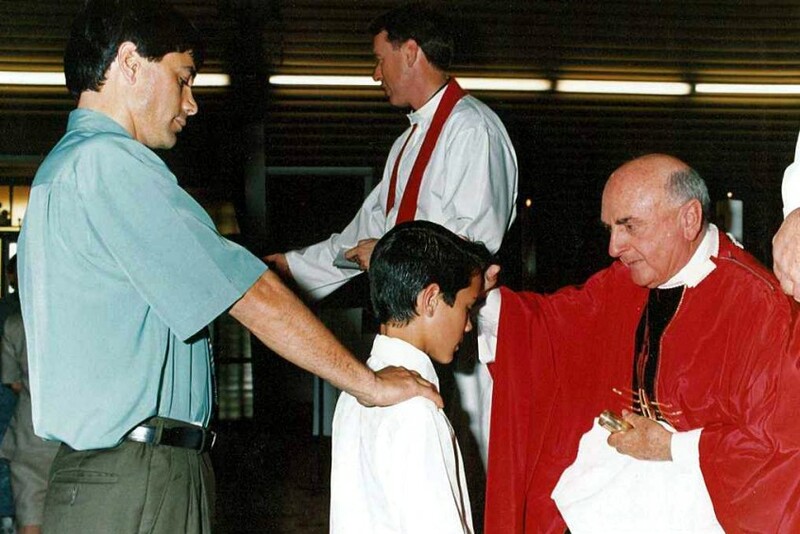 He was ordained to the priesthood on 27 July 1957 by Perth Auxiliary Bishop John Rafferty at St Mary’s Cathedral, four days shy of his 34th birthday. Mgr McCrann has touched countless lives in his 51 years of service in the priesthood. Photo: Supplied. Upon his ordination, he was appointed to the Cathedral Parish where he was based for 34 years and later held appointments at both Cottesloe and Embleton Parishes as Parish Priest. At Mgr McCrann’s 50th anniversary of his priestly ordination in 2007, Emeritus Archbishop Barry Hickey said one of the first things he remembered after his own ordination to the priesthood (two years after Mgr McCrann) was listening to the Monsignor’s sermons on ABC radio broadcasts from St Mary’s Cathedral. 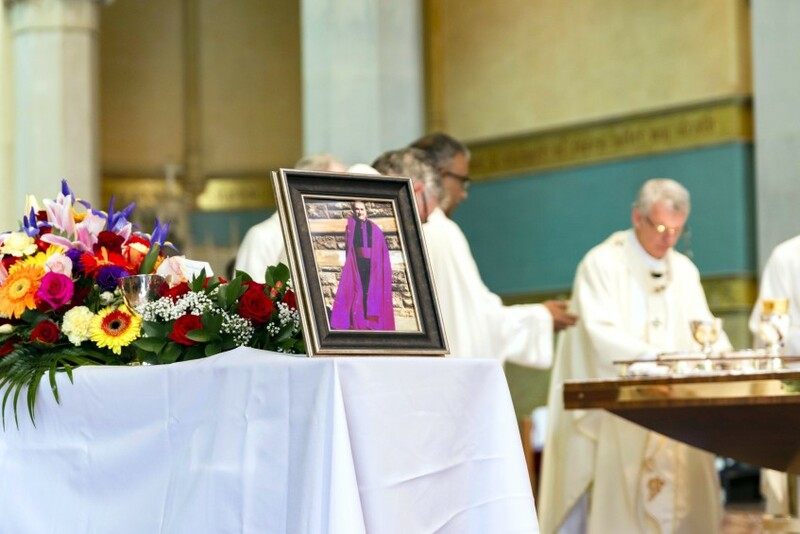 “As a commentator on the radio, he opened the hearts and minds of generations of people to the mysteries of the Mass,” Emeritus Archbishop Hickey said. Monsignor Peter Francis McCrann died peacefully on Sunday 17 February at the age of 95, his funeral was held at St Mary’s Cathedral on 28 February 2019. Photo: Feby Plando. He added that as Parish Priest, Mgr McCrann had been “as faithful to his duties as he was when conscripted to serve during World War II – with honour, dignity and as a man of prayer”. 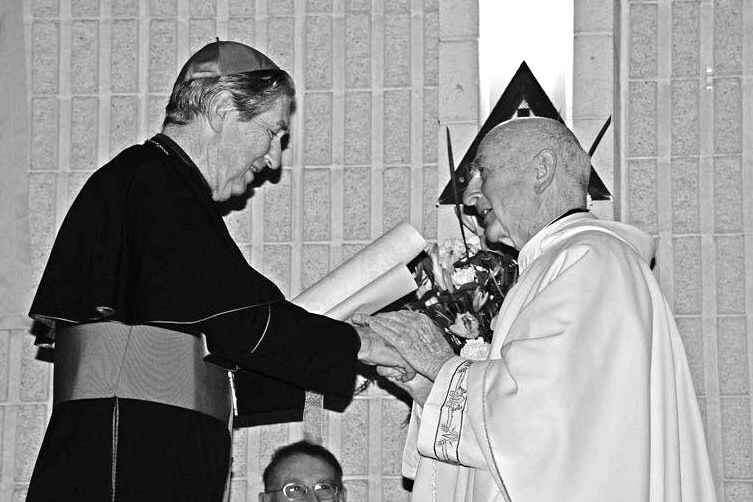 Mgr McCrann was thoroughly involved in the Archdiocese in his 51 years of service, holding various appointments such as Chaplain to the Catholic Nurses Association, Financial Secretary of the Archdiocese, Defender of the Bond for the Marriage Tribunal in 1968, and Chancellor of the Archdiocese. After serving as Chancellor for 18 years and at the request of then-Archbishop Launcelot Goody for his appointment to the Prelate of Honour of His Holiness, he was granted the title ‘Monsignor’ in 1982 by then Pope John Paul II. He has touched countless lives in the vast number of weddings, baptisms, Masses of Christian Burial, Confirmations and First Holy Communion celebrations he has presided over in all his years of the priesthood. Speaking at his 50th anniversary Mass in 2007, Mgr McCrann himself had said he remained a deeply spiritual man at heart. “[The priesthood] has always been a very spiritual thing, my vocation,” he said.